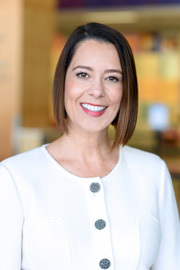 Alexandra (Alex) Carter, MBA, CFRE, is senior vice president and chief development officer of Children’s Hospital Los Angeles. Alex leads all fundraising and development programs in support of CHLA’s goals and priorities. She provides strategic leadership to the Foundation department to support the mission of CHLA as well as its ability to innovate and transform pediatric medicine. Additionally, she is responsible for developing and launching the institution’s fundraising campaigns and supports the Advancement Committee of the Board of Trustees. Alex has a wealth of fundraising expertise and has served as a fundraising advisor to Verity Health System, Albertina Kerr Centers and the Boys and Girls Clubs of Metro Los Angeles. Previous to her consulting for these nonprofit organizations, she served as chief development officer, Academic Institutes, for Cedars-Sinai Medical Center, during a $600 million campaign. She oversaw frontline fundraising teams including major gifts, planned giving and foundation and corporate relations and served on the institution’s leadership team for its partnership with the Women’s Heart Alliance, a national advocacy organization. Prior to joining Cedars-Sinai, Alex served as vice president of Public Affairs and Development at John Wayne Cancer Institute at Saint John’s Health Center in Santa Monica, California. She has also held leadership roles at Pepperdine University and at the American Red Cross in Santa Barbara, California. In addition she has federal lobbying experience and a vast array of national and international fundraising experience. Alex obtained a bachelor’s degree in Communication and Linguistics from the University of California at Santa Barbara and earned a master’s degree in Business Administration from Pepperdine University. She serves on the Executive Council for the Women’s Leadership Network of Jewish Vocational Services in Los Angeles and recently completed her term as a member of the Board of Directors of the National Association of Cancer Center Development Officers. Alex has also served on the Board of Directors for the literacy and service charity, Milk+Bookies, and has volunteered in support of dog rescue initiatives.